Engineered with technology that was way too far ahead of its time, it only seems fitting now that Aston Martin is examining its place in the automotive future with this, the new Aston Martin Lagonda Vision Concept. 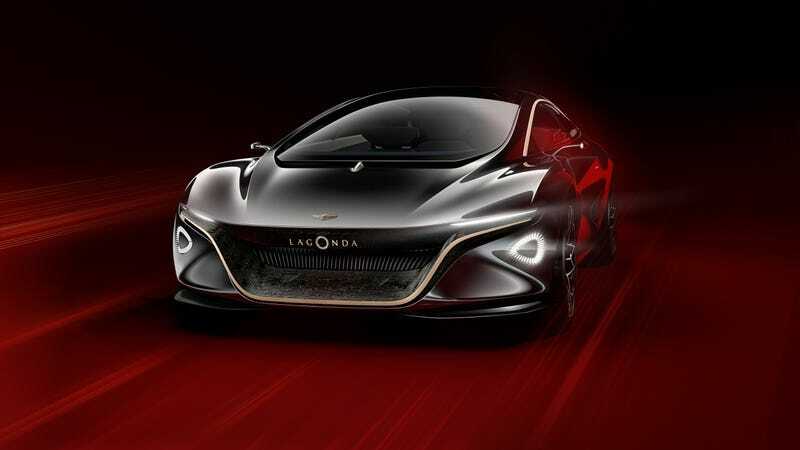 The Lagonda is a design study from which a new range of emission free luxury Aston Martin cars are expected to follow, with production planned to start in 2021. Without the need for an engine in the front, Aston designers were free to create a cabin that’s airier and roomier than traditional cars. It doesn’t have a hood because, ideally, there would be nothing there you’d need to reach. The concept was designed with its core structural strength rooted in the floor, so the back doors are rear hinged and can swing up and outwards. Can it be autonomous? Sure! It’s just a fun idea at this point. I really dig the front three quarters of the thing. It’s elegant and sleek, though it doesn’t really look like an Aston Martin. That’s okay, though. I’m not really sold on the back, however. The lines until that point keep up this upward momentum and then they kind of just stop. Like if you brushed your hair upwards and left it standing on end. The profile reminds me a computer mouse. The inside really is wild, though, as if it were something out of The Jetsons. Those whites and blues bring a real nautical feel to things. If this is the concept, I can’t wait to see what some of the production sketches look like.